This follow-up to last issue’s investigation into line counts explains how recently released industry standards provide a foundation to help improve the quality and speed of the transcription process. For years, many professionals in the HIM industry have struggled with what constituted on-time transcription. It’s great that there is now a set of guidelines in place, but will they have any effect? What causes the transcription platform and electronic medical record (EMR) to reflect conflicting turnaround times (TATs) for the same report? Anyone who has done business as a vendor serving medical record departments can tell you that it is rare to find any two facilities with matching TAT expectations unless they are affiliated under a common management group. Some are relatively lax with standards of 24 to 48 hours for anything other than stat reports, while others cannot imagine how anyone could tolerate anything over 12 hours, regardless of the work type. To get a better handle on these conflicting and wide-ranging discrepancies, the AHIMA and the Medical Transcription Industry Association (MTIA) convened a Joint Task Force on Standards Development to examine TATs for common document types (TAT4CDT) under the premise that very few, if any, true industrywide TAT standards exist. The resulting white paper, “A Standard Unit of Measure for Transcribed Reports,” provides commentary about how strict control of TAT impacts operational efficiency, enriches data capture and documentation, further empowers clinical decision making, and enhances patient care. The effort also details the current state of the industry, influence of current technology, workforce realities, and available guidelines supported by The Joint Commission. Unfortunately, even as the acknowledged source, The Joint Commission does little to identify specific TAT requirements for transcribed documents. For example, Standard P.C.2.120: History and Physical Completion requires a hospital to “define in writing the time frame(s) for conducting the initial assessment(s)” and demands a history and physical examination “to be completed within no more than 24 hours of inpatient admission” but falls short of specifying the time frames under which the result should be made available. Standard IM.6.10 stipulates that “the hospital has a complete and accurate medical record for patients assessed, cared for, treated, or served” and requires a “policy on the timely entry of information.” But again, it does not specify the mechanism by which the records are to be created or presented (eg, handwritten notes vs. transcribed reports made available through hard copy or electronic means). After collecting data on a cross section of medical records departments, the following TAT averages were found to exist (Figure 1). Please note that the mode response represents the most frequent answer to the survey. • distribution time (database availability and initiation of routing of print, fax, etc). It is not uncommon for an EMR to generate TAT reports based on dictation time and distribution time. Such reports will inherently conflict with associated reports from an outsourced vendor that tracks dictation time to their distribution time to the EMR, especially if the EMR interface is not configured for real-time processing (or the connection is interrupted). Although the definition of TAT provided by the AHIMA and MTIA white paper concludes with “availability,” it is important to include specific language in your request for proposals and/or contracts that reflects your expectation for the conclusion of TAT with your business. Similarly, contracted penalty levels for missed TAT performance should also reasonably acknowledge the white paper’s findings on average TAT compliance (Figure 2). Pressure to improve cost, quality, and speed will always drive change management initiatives. But before taking action, it is important to consider the impact on the complete transcription process cycle—from voice capture to accurate and timely distribution of the resulting EMRs. It does no good to save money on labor only to spend more on technology, or to drive TAT improvements only to shift quality management from the transcriptionists to the HIM support staff (or worse yet, the physicians). Although a common volume measurement scale in itself does not save money, it can improve your ability to gauge the financial impact of any change. By converting the cost of any transcription-related process to a common cost-per-line scale, you can accurately predict the true financial impact to the collective budget. For example, the popularity and effectiveness of speech recognition is certainly on the rise. 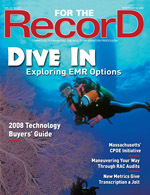 The reality is, however, that there are places where, although transcriptionist productivity improved dramatically, when all related expenses (hardware, software, service contracts, per-physician license fees, interface fees, etc) were considered, the total voice capture to document distribution department annual cost actually increased. By converting all associated costs to a cost per line along with conservative estimates on the expected labor savings, such missteps can be avoided. Certainly, there are now more successes than failures with the deployment of speech recognition. Its use as an example simply highlights the need to convert all process-related expenses to a cost-per-line metric. Another example would be staff member costs to manually distribute reports to the floors. If technology is used to route documents to follow the patient and print at the nurses’ station supporting their care, the impact of the full-time employee savings can be converted to an annual per-line rate effect as well. In other words, sometimes the math will show a savings, and sometimes it will not; however, the true impact of any change cannot be identified until all costs are considered against a single metric. The visible black character volume measurement effectively serves that purpose. There is probably no factor that drives the cry for change in medical transcription from physicians more than document quality. Unfortunately, for some physicians, quality may mean that the transcriptionist types exactly what they said, regardless of grammatical errors. For others, quality is considered to be exactly what they meant to say, where grammatical corrections are expected. The only way to fairly rate the performance of an individual transcriptionist, department, or vendor is to apply the universally defined errors and values to a statistically valid random sample set. Without such random selection, it is just as easy for a vendor to generate a quality report for a set of hand-picked documents that reflect good quality as it is for a client to focus solely on a group of documents that demonstrate poor quality. Applying the Association for Healthcare Documentation Integrity (AHDI) Best Practices Quality Assessment recommendations to a randomly selected sample set is the only way to achieve an unbiased score. To avoid conflicts, procedures for how reports will be selected at random to establish the sample set should be included in any contract or employment agreement. Although the AHIMA and MTIA TAT4CDT effort identifies existing industry practices based on their survey, definitive clinical justification for one facility timetable over another simply does not exist. When asked to explain why TAT levels are set the way they are, HIM professionals usually have one of two responses: “That’s the way we’ve always done it” or “That’s what our physicians are used to, and they will not accept anything less.” What may be more interesting is that there is an equal balance of both answers regardless of how tight the expectations. It is possible that the real value in the TAT4CDT white paper comes from its analysis about what contributes to missed TAT performances and how to improve the overall effort. It’s expected that this subject will continue to be defined on a facility-by-facility basis—and yet performance against individual targets can be improved by applying the recommendations set forth by the Joint Task Force. In the end, it comes down to managing expectations through agreed-upon quantifiable metrics, whether it is between transcription managers and staff members or with outside vendors. The AHIMA, MTIA, and the AHDI have now supplied the industry with the necessary metrics. It’s up to HIM professionals to embrace and apply them in order to elevate the ability to measure and audit the complete transcription process. Conflicting measurement scales serve no purpose other than to perpetuate confusion and open the door for unmet expectations. We’ve entered a new era; it’s time to measure up. — Dale Kivi, MBA, is director of business development for FutureNet Technologies Corporation and has served on the Medical Transcription Industry Association Billing Methods Principles workgroup, as well as the steering committee for the Association for Healthcare Documentation Integrity Quality Assessment Special Interest Group.